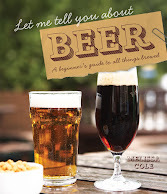 Evening guys, this is one that I'd appreciate you telling any local pubs who have the power to buy in their own beer about, it's a good cause. Iain Turnbull is dying from terminal prostate cancer and rather than wallowing in self-pity and saying woe is me he's brewing a dark mild with Tryst Brewery, Larbert near Falkirk at 6.9%ABV (a la Sarah Hughes) to raise money for the Macmillan nurses. 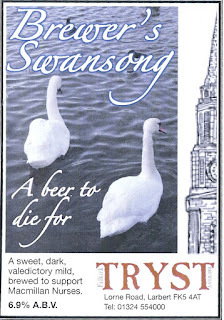 If you’d like your local, or your pub, to stock the beer then contact John MacGarva Tryst Brewery, Lorne Rd Larbert. FK5 4AT tel: 01324 554000, and tell them I sent you. Please also pass this on to anyone else you know with independent purchasing power and also if any of you are Punch licensees, he’s managed to get a listing in Scotland and I’m sure enough requests may see it listed in England as well. It's a good cause and, I hear tell, a very good beer. We're trying to spread your message of charity through beer. Thanks for the heads up. Bits & Pieces - me & the post that is! Does My Bum Look Big in this Barrel?